The coal industry is on life support, and that's not changing anytime soon. 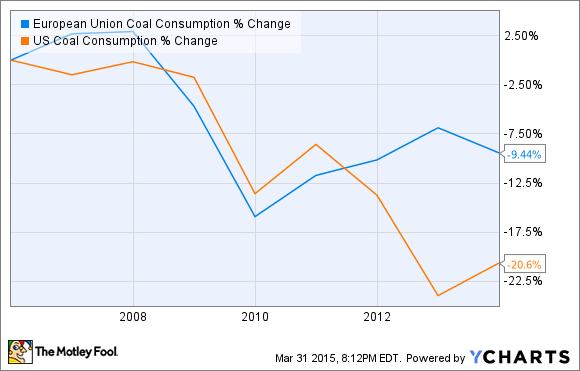 For years, coal supporters have been saying that a turnaround is just around the corner. China's demand is about to pick up, domestic environmental regulations will be struck down and we'll fire up coal plants again, or clean coal is here! Let's face it: Coal is dead, and it's been a long time coming. Peabody Energy (NYSE:BTU), Arch Coal (NASDAQOTH:ACIIQ), Alpha Natural Resources (NASDAQOTH:ANRZQ), and others are just barely holding onto survival while reporting hundreds of millions in losses annually. But they'll eventually be scrapped for parts as the energy industry moves to cheaper forms of energy. Whether you accept it or not, that's the reality of coal in 2015. 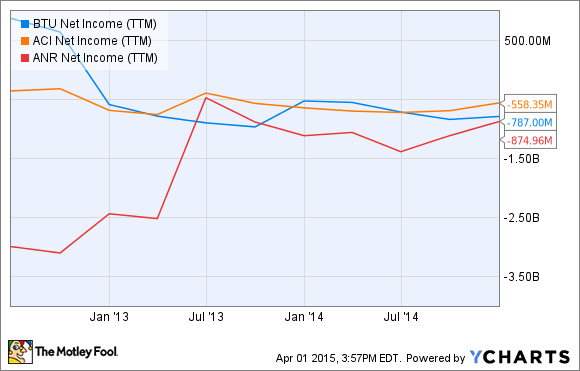 BTU Net Income (TTM) data by YCharts. Whether it's regulations, smog, or cost, there's no country that wants to build more coal power plants than it absolutely has to. That puts coal producers in a tough position, dealing with falling demand and competitors that are fighting over scraps of the coal market. China has been reliant on coal for energy growth, but cities choking on pollution have pushed the country away from the fossil fuel. Beijing is shutting down all four of its coal plants to reduce pollution and replace them with plants burning natural gas. The country has also made a huge investment in renewable energy, installing more wind and solar than any other country in the last two years. India has said it wants to end coal imports in the next two to three years. Next to China, this is the other driver of coal demand in the past five years, helping offset consumption declines in Europe and the U.S.
European Union Coal Consumption data by YCharts. If developing countries like India and China are reducing imports and reliance on coal, and developed countries like the U.S. and Europe are already cutting back on coal consumption, where will all the coal go? Coal supporters like to blame regulation for coal's current demand problems. That's part of the problem, but the bigger problem is competition. As coal plants age, it is now more cost-effective to build natural gas plants, wind, and even solar power plants to replace them. Below is Lazard's levelized cost of energy ranges for natural gas and coal plants in the U.S. You can see that coal was more expensive than natural gas long before recent EPA regulations were proposed. Data source: Lazard. Chart by the author. Coal versus solar or wind is even more problematic, because not only are they lowering costs at a rapid rate (while the cost of coal slowly rises), they're now lowering costs below even the low end of coal in some locations. In the chart below, you can see that coal's cost range of $66-$151 cents MW-hr has been overtaken in the past couple years by wind at $14-$67 per MW-hr and solar at $56-$86 per MW-hr today. Coal is simply no longer cost-effective versus alternative energy sources. That's the biggest problem coal miners face, and the problem will only get worse as wind and solar cut costs. With these market dynamics laid out, why would anyone buy coal stocks now? The best-case scenario is that you pick the company that survives while others go bankrupt, but that's not a recipe for big profits, that's trying to catch a falling knife. The better idea is to invest in companies who are investing in energy sources of the future. SunEdison (NASDAQOTH:SUNEQ) is the world's largest renewable energy project developer, First Solar (NASDAQ:FSLR) is a leader in utility scale solar, and SunPower (NASDAQ:SPWR) is solar's efficiency leader with exposure to nearly every market there is in solar. These would be far better bets in a growing industry than buying a dying coal miner. Some people disagree with coal's demise, but it's nothing I haven't heard over and over and over again. The fact of the matter is, coal is on the wrong side of history, and it's time to accept that before throwing good money into bad stocks.